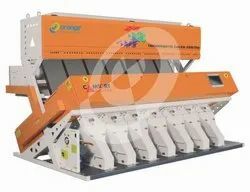 Offering you a complete choice of products which include split sorting machine and guargum split sorting machine. 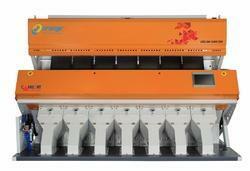 We are one amount the manufacturer of Split Sorting Machine (Camsort Magic Plus). We manufacture these machines with the help of our highly trained professionals by making use of advanced machines and tools. The offered Pulses Sorting Machine is timely delivered under a specified time and offered at a reasonable price. Programmable Defect Size helps in sorting double boiled and rose rice with bran streaks. Small spot defects can be measured and allowed with accept. FPGA & CPLD As usual you can keep counting on us because we are using Field Programmable Gate Array with 2 million gates that is designed and manufactured in Germany especially for ORANGE and CPLDs for highly reliable computer and electronic circuits. Line Scan Camera with High Resolution and enabled to control front and rear camera individually to remove light and dark defect. User friendly Machine Human Interface User friendly 7" touch screen in 240 and below channels & 10" touch screen in 300 and above channels machine with preloaded programs for sorting 32 commodities. It displays the key parameters screen to screen to ease the operator in handling the machine and get maximum performance out of it. Machine Build We use highly reliable industrial grade components for building the machine. The chutes are made of aluminum and hard anodized for smooth flow of material, thus increasing the machine's reliability manifold. Quad Level Sorting Technology with the all new Camsort Plus series color sorters you can now set different levels to sort precise spot defect, color defect and chalky. Camsort Plus is equipped with DEFECT GROUPING BY DARK AND LIGHT sorting technology. It can group the defects at two levels as color defect & spot defect and at each group it can sort dark and light defect thus giving you the benefits of 4 levels of sorting for your input commodity. Jet Valve 1 Millisecond response time ejector with 5 billion stroke life cycle . Guargum Split Sorting Machine (Camsort Plus) manufacturer from Coimbatore.The provided sorter is widely appreciated for its excellent quality CCD image sensor. This Split Sorting Machine is available with us in varied technical specifications at reasonable rates.